Plot: A prostitute arrives in Pago Pago where she tangles with a hypocritical preacher who tries to reform her. Swanson chose Somerset Maugham's controversial play "Rain" for her second independent production. She not only had to battle the censors on this one, but there were numerous other problems as well. A suitable leading man could not be found for the role of the marine who falls in love with Sadie and Gloria finally realized that the perfect man to play the role was director Raoul Walsh himself. He had not acted in several years and it took Gloria one week to convince him that he would be right for the role. Another problem arose with the cinematographer. 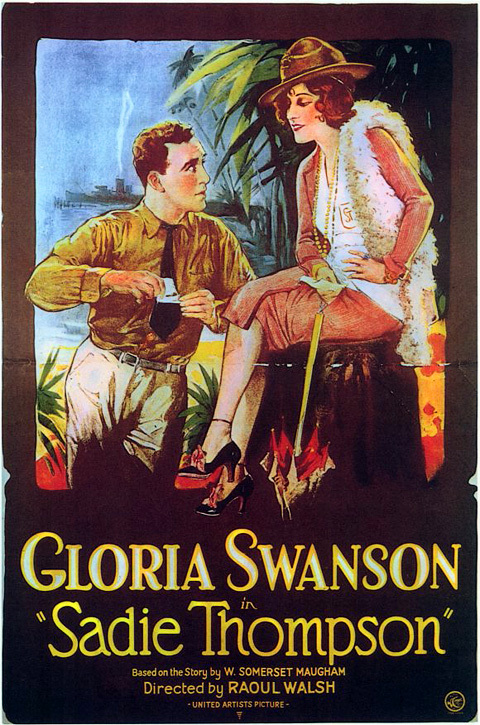 She had borrowed George Barnes from Samuel Goldwyn and after three days of shooting, Goldwyn recalled Barnes to do a film for him. Since their contract stipulated a three day trial period, there was nothing that Gloria could do except find another cinematographer. She eventually went through three additional cinematographers before settling on Oliver Marsh. And, as before with Love of Sunya, the production went over budget and money had to be borrowed to complete the film. Regardless of the setbacks, however, Sadie Thompson proved to be a critical and a box office success. Gloria was praised for delivering one of her best performances to date and she was nominated for her first Academy Award (the first year for the Awards) but she lost to Janet Gaynor. The New York Times wrote: "Miss Swanson's acting is an outstanding achievement. This production is naturally handicapped when compared to the stage version, owing to the lack of sound and striking colors, and therefore it is the greater credit to Miss Swanson to have made her role so absorbing. She may be guilty of occasional extravagances, but the sum total of her portrayal is so clever that any trifling shortcomings can be overlooked."